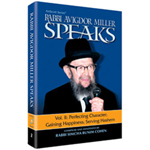 Got Judaica — Rabbi Miller Speaks Volume 1 gedolim of our time. His writings and thousands of recorded lectures continue to have a deep and lasting impact on untold numbers of people worldwide. He was tireless - in his learning, his teaching, and his striving for personal growth. The inimitable logic, wit, and candor of his discourses captivated, uplifted, educated, and encouraged. The essence of his thought, which he presented in his meticulously prepared lectures, is captured in this first volume of essays compiled from his recorded lectures. 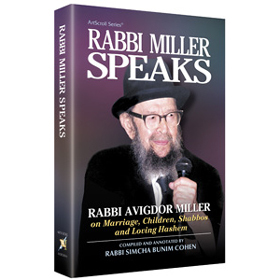 This compelling selection is dedicated to talks he gave on Love of G-d; Marriage; Children; and Shabbos, and it includes a list of every source referenced in the essays. Prepared by Rabbi Miller's disciple and grandson, Rabbi Simcha Bunim Cohen, whose halachic works are well-known to ArtScroll readers. Rabbi Avigdor Miller zt"l was one of the gedolim of our time. His writings and thousands of recorded lectures continue to have a deep and lasting impact on untold numbers of people worldwide. He was tireless - in his learning, his teaching, and his striving for personal growth. See large image for sample page.